Until I was about eight, we lived next door to a family that made merienda to sell to our neighborhood every afternoon. They varied it up and would make fried dough twists one day, champorado the next day, and suman the day after that. One of the things they used to make were hotcakes. These were thin and chewy, kind of like very thick crêpes, and deep yellow in color. The mother would fry them on a big carajay brushed with oil (using a makeshift brush of a frayed strip of banana leaf tied to a bamboo stick). She would turn the cooked hotcake onto a big plate, where one of the daughters would slather the top generously with margarine before, even more unsparingly, sprinkling it with white sugar. The hotcake would then be rolled up, sugar side in, and the roll secured with a strip of banana leaf. If you happen to buy them fresh out of the frying pan, the margarine-sugar filling would melt into a syrup and drip down your arm if you didn't eat fast enough. I used to just lick my arm, of course. If you overdid your afternoon nap, your hotcake filling would be a yellow slick that would crunch with every bite. This was still good, although I suspect my appreciation was a learnt one, out of gratitude that I woke up just in time to still have any. I'm not sure when 'hotcake' became 'pancake' in my food vocabulary. Or when I decided I didn't want to make hotcakes like the kind I grew up on. What I do remember is that making pancakes from a box of Pillsbury mix was one of the first things I learned to do in the kitchen. I always enjoy a breakfast of pancakes and I like them so much I could have them without any butter or syrup. I could have them for lunch even. And dinner, to be honest. I often dump a generous helping of fruit on top and collectively call it healthy. But regardless of how tasty and 'perfect' boxed mixes are, using them always leaves a bad taste in my mouth (not literally). They're instant, boxed, and mixed by machines without much love. I guess that's a bit snobby, however, given how often we have pancakes, I don't think I can be blamed for wanting to know exactly what goes in my family's stack. I have a special aversion to those 'one-step' mixes that require only water to make - things in them like 'powdered egg' leaves me suspicious! Pancake mix ingredients: (clockwise from right) All-purpose flour, whole wheat flour, caster sugar, baking powder, baking soda, salt - that's really all there is to it, and frankly, that's all there should be! Besides, my kids always want chocolate chips in them. Between a fluffy, fragrant, perfectly moist and tender pancake with no chocolate chips, and a flat, chewy one with chocolate chips, they would pick the latter. They would probably take just the chocolate chips for breakfast if I let them. Sure, I take full accountability with my undying love for chocolate, but I digress. So, to redeem the pancake breakfasts, I thought I'd make my own mix. You know, with whole wheat flour, and maybe even sneak in oats. I had high hopes even from the first failed mix because, like I said, they're forgiving about the pancake itself. Turns out, it wasn't the kids' pickiness that was going to be my challenge with this homemade pancake mix commitment thing I had decided to make. The challenge was myself. The first mix was too runny, the next one, too "eggy" and dense; the one after resulted in a very thick batter. The kids ate all these attempts, but I didn't. If this doesn't declare my love of a good pancake, I don't know what does. Thankfully, the fifth batch came out great! I got so excited that I thought I'd coin 'fifth time lucky'. And then I realized that doesn't actually sound too great, so I went back to making a cutesy label to hang on the jar that now contains many future morning smiles. And many a post-breakfast sugar rush. One more thing before the recipe: have you ever experienced splitting a chocolate chip muffin with someone and then finding that all the chocolate chips were on the half that didn't go to you? You haven't? You're exceptionally lucky. I, on the other hand, have developed enough foresight to spare my lovely weekend mornings of the "Kuya got a bigger pancake!" or the "Ate's has more chocolate chips!!". I know it's important to teach kids that life isn't fair but suffice it to say I'm not going the pancake analogy route. start with a measuring cup. Or ladle. 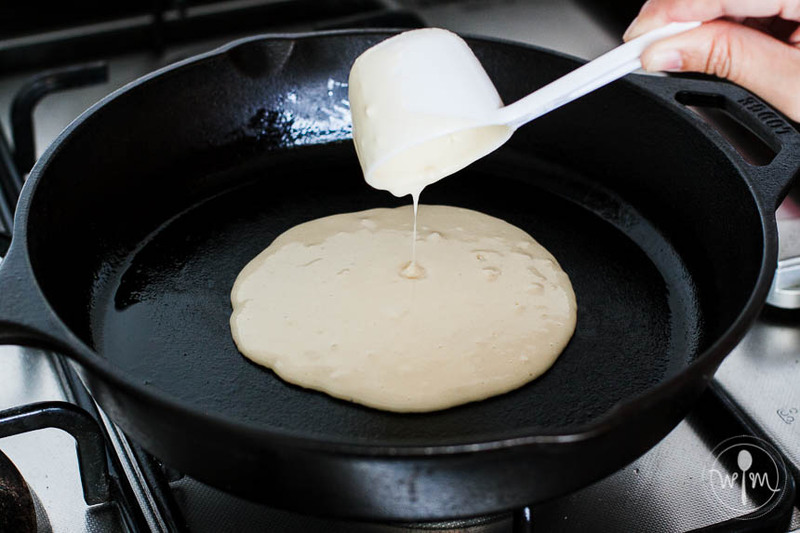 Fill the same one up to the same level and your pancakes will be roughly similar in size. is guaranteed if you drop the chips in after pouring, vs. mixing them in the batter. The caveat is that you need to move quickly and get cracking immediately after pouring the batter, otherwise they won't sink in enough and might burn when you cook the other side. and most of the bubbles have popped, it's time to flip. The pancake, not at your kids. If you waited properly for the edges-and-bubbles cue, yet flipped to find a burnt side, your heat is on too high. On rebellious mornings, they'd take the food-service-sized bottle of chocolate syrup to the table and pour amounts that drive me up the wall. This wasn't one of those mornings. In fact, this wasn't a morning at all, they're having it here for an afternoon snack. They usually finish 1-2 pancakes each, which works, because the recipe below makes about 6 pancakes. Below is the printable recipe - as usual, please read all of it before starting, so you don't miss the notes and tips I've included. I can get pedantic, but hey, I did say I love good pancakes. If you make this and like it, please share with me using the hashtag #pinayworkingmom! Put all the ingredients in a big bowl and mix throughly with a whisk. Transfer the mix to an airtight jar and use within 3 months. If using, pour the lemon juice or vinegar into the milk and let stand for 5 minutes. Beat the egg, oil and vanilla extract together in a bowl. Add the milk mixture to the bowl. Stir in the pancake mix until just incorporated. Do not overmix - the mixture should just be evenly wet but should still have some lumps in it. Put a frying pan over medium heat. If you're not using a nonstick pan, lightly brush some oil when the pan gets hot. Drop 1/4 cup of the batter on the preheated pan and cook until the edges look dry and the bubbles that surfaced have popped. Flip the pancake and cook the other side for about 1 1/2 minutes. Serve warm with some fruits, honey, or syrup (chocolate or otherwise!). This mixture makes about 5-7 pancakes, depending on how patient you are with letting the batter drip from the cup. No whole wheat flour? You can use regular all-purpose flour for all the flour called for in the recipe. Aletrnatively, you can grind some oatmeal into a flour using your food processor. You can skip adding the lemon juice or vinegar, but if you do decide to add it, it's important not to skip the standing time. The milk and acid need the reaction time to slightly curdle and thicken. This mixture will make your pancakes more light and tender. What we're actually doing is substituting for buttermilk because I've not really figured out where to get it around here, and I thought maybe a lot of you might not be able to either. There's buttermilk powder, but I've always found the milk+acid route is much simpler. 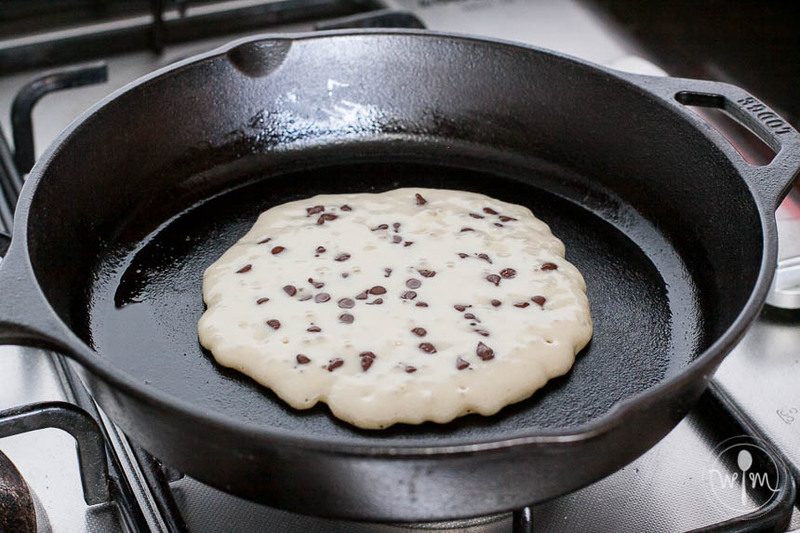 If adding chocolate chips or dried fruit, immediately sprinkle these on the pancake before most of the bubbles surface. This is to ensure that the bubbles pop around the morsels and coat them with batter. This keeps the morsels from burning when cooking the other side. STORAGE: Whole wheat flour can go rancid, so if you have the fridge space, keep the jar in the fridge or freezer. Otherwise, just store it away from heat or reduce the recipe to an amount your family will consume for a shorter period. (Or simply have pancakes more!) Alternatively, you can scoop one-cupfuls into individual freezing bags so you don't drive your husband crazy with a big glass jar in the fridge. Speaking of freezing, I tried freezing some leftover cooked pancakes from my test batches and they seem to lend well to being frozen. Simply thaw them in the microwave for about a minute; enjoy! Whole wheat flour is available at Healthy Options, organic and regular variants cost much less than Php 200 per pound. If you don't have a branch near you, ask for whole wheat flour in your local bakery supplies shop, they will likely have it but probably no organic option.